Watch as Davison’s Better Way to Invent turns Pete’s Surprise Pan idea into a store-ready reality! During a brainstorm session for a product that would use a nail to cook a potato from the inside out, Pete came up with an idea for a better cupcake pan. “Why don’t we just push nails right through a muffin pan? Then we’d be able to put something right on that nail; marshmallow or a Snickers bar,” said Pete, which would create a treat with a surprise at its core. Pete Meier is an Inventionland employee who usually focuses on bringing other people’s ideas to life. His curiosity and adventurous nature lead to a lot of tearing things apart and a great amount of blowing stuff up. So when Pete proposed an idea for a cupcake pan, more than a few heads turned at Inventionland. 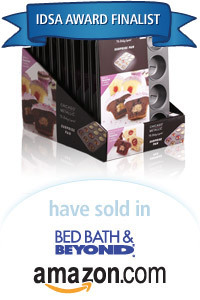 Pete’s Surprise Pan has sold in Avon, Bed Bath & Beyond, QVC, Amazon.com and at several other major retailers.